Atlas Elektronik Canada Ltd announced today an agreement with Magellan Aerospace Corporation for the design and development phase of the SeaSpider Anti Torpedo Torpedo (ATT) program. The initial CDN $19 million phase of the program was launched in January 2019 and is expected to conclude in 2023. Magellan will lead the design and development of the SeaSpider ATT rocket motor and warhead sections of the torpedo that includes design, build, test, and product qualification. 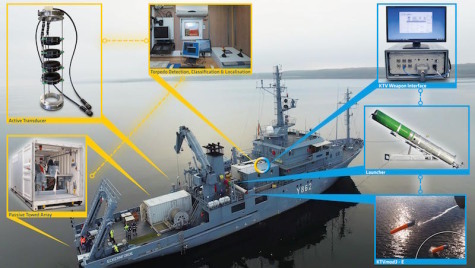 SeaSpider ATT is a new naval defence product by German Atlas Elektronik, a company of Thyssen Krupp Marine Systems, that can be utilized by surface vessels and submarines for “hardkill” defence against attacking torpedoes. The capability of SeaSpider is a marked improvement over currently available anti-torpedo systems that reply on decoy and jammer countermeasures rather than, like SeaSpider, on destroying the attacking torpedo. This technology has initially been developed in Germany by Atlas Elektronik together with the German Ministry of Defence and now gains a Canadian element in product development. The SeaSpider ATT will combine the best technology and decades of experience of Atlas and Magellan – the expertise of Atlas in Germany with torpedoes as well as submarine and naval systems – and the industry leading rocket technology of Magellan in Canada. Atlas Canada is positioned to manage and support test and trials activity in Canada for Atlas Germany and will provide final assembly and logistics services during serial production of the SeaSpider ATT. The Atlas Elektronik Group stands for maritime and naval solutions above and below the ocean surface. The company holds a leading position in all fields of maritime high technology, from command & control systems including radio & communication systems for submarines, surface combatants and mine warfare systems and ranging to heavyweight torpedoes, coastal surveillance systems and in-service support. Atlas is an operational unit of Thyssen Krupp Marine Systems, and has a workforce of around 2.200 highly skilled employees. Thyssen Krupp Marine Systems is one of the world’s leading system suppliers for submarines and naval surface vessels. The company has a history of naval shipbuilding that dates back centuries and offers state-of-the-art technologies, innovations and extensive and dependable services to customers around the world. TORONTO --- Magellan Aerospace Corporation announced today an agreement with Atlas Elektronik Canada Ltd. for the design and development phase of the SeaSpider Anti Torpedo Torpedo (ATT) program. SeaSpider ATT is a new defence product that can be utilized by surface vessels and submarines to detect and destroy attacking torpedoes. The SeaSpider is a marked improvement over currently available anti-torpedo systems that reply on decoy countermeasures rather than destroying the attacking torpedo. The SeaSpider ATT combines the best technology and decades of experience of Atlas and Magellan – the expertise of Atlas in naval systems and torpedoes and the industry leading rocket technology of Magellan. "The partnership between Atlas and Magellan will bring to market an innovative new torpedo defence system that will be the first of its kind in this growing market segment", said Mr. Haydn Martin, Magellan's Vice President, Business Development, Marketing and Contracts. "We welcome the opportunity to collaborate in this exciting new endeavor with Atlas Elektronik." Magellan Aerospace Corporation is a global aerospace company that provides complex assemblies and systems solutions to aircraft and engine manufacturers, and defense and space agencies worldwide. Magellan designs and manufactures aeroengine and aerostructure assemblies and components for aerospace markets, advanced proprietary products for military and space markets, and provides engine and component repair and overhaul services worldwide. Magellan is a public company whose shares trade on the Toronto Stock Exchange, with operating units throughout North America, Europe, and India.